I really wanted this blog to be extremely simple and no frills. A basic online journal to talk about my venture into barefoot running. I have another blog, Avocational Singer, and I put a lot of time and energy into it. I have gotten thousands of hits on my other blog. In the blog world, that's not very much, but I appreciate that anyone is reading what I have to say at all about singing. I try to create a good product over there. I am not interested in making any kind of money writing a blog. I did monetize my Avocational Singer blog because I wanted to check adsense and see how many people were clicking. Just one of those blogger-obsession things. But with this blog, I wanted to keep it very bare bones. I also did not want to have to worry about making well-constructed pieces of writing. I just wanted to be able to babble and blather over here. Now it just so happens that I love to write, so sometimes my first draft comes out somewhat grammatically acceptable. But over in the other blog, it's not just about singing, it's also about writing. I love to write. I work a little harder to create pieces of writing over there. But this barefoot running blog is more just like a sloppy journal. Of course I'm aware someone might read it, so I try to keep things presentable and correct spelling and things like that. But I already have a "serious" blog and I just wanted to hang out over here with the running stuff. So, because of that, I didn't add any fancy boxes, or put any adsense ads over on the side. But recently, I've been thinking about how much I enjoy reading some of the other blogs by barefoot runners. I also appreciate that some of them have come over here to read and comment on my posts, and how they've been encouraging me. For that reason, I have decided to share a few blogs I've been enjoying over on the right, and have added the little blog gadget. Some other beginner barefoot runners may stumble on my humble little paragraphs and they might appreciate finding some of these other blogs. I have been reading many more barefoot blogs and will probably add more as I go along, but I thought I'd start with the few that I've listed there for now. I find a lot of interesting blogs to read on these other bloggers' pages, so if you want to read more, visit those pages and look at all the blogs they have listed there and you'll have plenty to keep you busy for a few evenings. The other thing I've done is put the adsense gadget on the blog because I do want to see the clicks. In the spirit of barefoot running, I had wanted to "barefoot blog" and not worry about the clicks. But, I guess I am so used to checking the clicks on my other blog that I will have it here too. So now that I have explained my little changes. I will go read some other blogs before I go to bed. Enjoy! Oh, wait, just one more thing. One blog over there is by my friend, Robin, called The Athletic Performer. Robin is an amazing runner. She has encouraged and helped me a lot. She is an opera singer who wants to encourage singers to be fit. She is a high level runner, but because of this "mission" she has, she condescended to run with me last year. I was suffering from my plantar fasciitis at the time, and I was doing run a minute/walk a minute, and she went the whole way with me. She was wearing Vibram Fivefingers and that was the first time I ever saw anyone in them. Back when she started her blog, she had Christopher McDougall's Born to Run: A Hidden Tribe, Superathletes, and the Greatest Race the World Has Never Seen listed as a recommended book on there. I bought the book for myself and also as a birthday present for my marathon runner sister. Like so many, it was that book that started me thinking about running barefoot and started me wondering if my shoes were right for me. Anyway, if you check out Robin's adventures you will be amazed. She is trying to run a marathon a month this year, and so far she's on target. In between her marathons she does other events, like some triathlons and some ultras. I cut off a quarter mile lollipop loop that I had added last time to see if that helped the little sore bone issues on the left foot. It felt much better to step back that little bit. It may seem like only a little bit, but that's because this is barefoot, and I'm learning that barefoot increases are greater than they would be if I had made the increase in shoes. So, as mentally and cardiovascularly ready as I feel to increase distance, my feet are telling me to stick with the mile and quarter for just a bit more. I also got some pointers on my last post from Barefoot Josh about posture and bent knees. I got them too late to observe for today's run, but I will keep them in mind for Monday. I am grateful for the help. Today when I got out there, I ran into two friends of mine out for a brisk walk together. One of the two friends has in the past been an avid runner. When I first excitedly told her I was going to a barefoot running workshop many weeks ago, she had expressed disapproval. Well, today, I said hello to my friends, and blurted out something like, "oh, I know you disapprove, but I'm doing it barefoot." That was a mistake. I should have just said hello. I guess I felt a little nervous about the disapproving friend. I made a decision then and there never to mention my bare feet unless someone brought it up first. My friend said, "It's not that I disapprove, it's that I worry about tetanus." "Oh," I laughed back, and I made a silly joke about it. But I do not think tetanus is a joke. As I proceeded on to my barefoot run, I began to think that it would be really nice to just join in with the normal moms and walk every morning. There they were, going their way, having a proper vigorous healthful daily walk on the boulevard together, and there was I, going the other, in my weird bare feet. I could just turn around, put on some sensible New Balance walking shoes (not those silly gorilla feet), and walk along and gossip and be healthful, and then go for a cup of coffee afterward. Or I could go do that risky barefoot thing. Believe me when I tell you this, I really am not doing this to be different or attract attention. I just feel very strongly that it is the right thing to do. It also feels like something I'm destined to do. I almost can't help myself. From the moment I first heard about barefoot running, to the moment I first tried it, something seemed to be pulling me along. Once I had the information, it all made sense. Now that I'm experiencing it, it makes even more sense. I just have to follow this way right now. Even though I'm at the very beginnings of it, I feel a current pulling me along. I took a picture before I set out today. 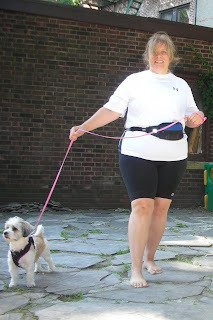 This is what I look like with my dog, my little running pack stuffed with essentials -- doggie bags, paper towels, hand sanitizer, cell phone, keys -- and my bare feet. First Dog Poop --- Ewww! Well, it happened today. One of the reasons I bought Vibrams first instead of trying barefoot running was my concern about stepping in unclean things. So far I have artfully dodged and avoided these "things" on the sidewalk as I've run the past 19 barefoot miles of my life. I know that I probably have been stepping in all kinds of things like doggie wee wee and other kinds of residue that is not apparent to the eye, but -- like the swimming pool where all the kiddies are swimming in the summer -- you can manage by pretending that everything is clean. But there was no pretending about the sticky feeling squishing in the hollow space between my big toe and the heads of the first and second metatarsals. This, like the stubbed toe of two days ago, was not done while running however. Again, while I'm barefoot running, my concentration and focus level is pretty high. I think I might even be safer in my bare feet while running because of that. No, this happened while I was cleaning up after my pooch, Daffodil, who runs with me. She had left a little extra piece without my having seen it, a few inches away from the main pile. When I thought I was done, I stepped away and -- "squish!" This is just -- well -- this is just not me. I am way more genteel than this. I feel like I'm leaving ladyhood behind with each barefoot step I take. I kept thinking of the lyrics from a song in the musical Guys and Dolls: "A lady doesn't leave her partner .... it isn't nice" and they were running through my head like, "A lady doesn't step in dogpoop .... it isn't nice!" I had a paper towel with me, thankfully, but had failed to put in the little bottle of hand sanitizer that I had purchased for my little running waist pack. Gotta' remember to bring that next time. But once I got into the run, the little mishap was forgot as I concentrated on landing my feet properly. I have been having trouble with my left foot -- mentioned here before -- with a sore or bruised feeling on the fifth metatarsal head, which I thought was being caused by leaning too far over on my foot to avoid hitting a sore spot on around the third metatarsal head. I also mentioned that I have a bruised spot on my heel, which may have occurred for the same reason as the other. So, I've been trying to figure out how to handle these symptoms. I have several choices. I can just stop running altogether and heal up those spots and start all over again. I would rather not do that, of course, because I spent 6 months healing up the plantar fasciitis and have been so happy to be out there again. However, doing this properly is more important than any feelings of happiness I may have about running again. I can decrease the distance I'm running and go back to a mile -- or even less, a half mile -- and just stick with that for a few more weeks (months?) But I am feeling so good out there I hate to do that. When I stop now I want to go further and have been holding myself back. I can see if I can improve my form, which I did do today. Trying to fix it on the go. I noticed that as long as I'm running an a smooth surface, there is very little problem or pain. It's when I hit those kind of sidewalks that have the bumpy stones in them, or go out on the asphalt where it's not smooth and a little more "rocky," or when I run on those bumpy tiles I've shown you. The uneven stones hit those sore spots and dig in to them. I feel my excess weight is aggravating the situation as well, and if I could just watch my nutrition better and drop a few pounds, that would help. I noticed that when I land like I'm running in place, that I land pain free without aggravating any of the spots. It's hard to describe, but the sense of pushing forward on that third metatarsal head is not good, but the feeling of lightly landing on the midfoot area slightly back from that metatarsal and the feeling of lifting the foot up, like you do when you run in place, feels much more right. However, I forget to do this. So part of my task today was to keep reminding myself : "Run in place." And what do you think happened? I came upon a man, standing on the boulevard, just running in place. He was in an immaculate white sweatshirt, and he was just standing there running in place. I passed him, and took a look at what his feet were doing. Yup, that's kind of the way I want to pick my feet up and put them down, I thought. I ran a few blocks past the running-in-place man and then turned around. I came upon him again and made another note of what his feet were doing. I was almost done, but I thought it was really weird that it would be in that moment I would see the "message" of the running-in-place man. Almost a reinforcement of what I had been thinking and trying to do. My First Stubbed Toe --- OUCH!! My husband told me that I'm not allowed to mention this toe I stubbed this morning to him for two days, since he is sick of hearing about it. ("Do you think it's broken? Can I run on it? Can I do Kung Fu on it? Will you just look at it again? How can you tell it's not broken?") So, I thought I'd come over here and blog about it. Yes, after writing that post recently about being careful and the risks and stuff, I must have had it on my mind, and, sure enough, today I stubbed my toe. In case you were wondering, it's the fourth toe on my left foot. Do you want to see it? I don't know how to get these pictures to line up side by side. Guess my html is not that good. I have a closer-up shot I'll put below this. But I'll let you know here that I did not do this while running. I went out for a wonderful barefoot run today. I was starting to get the hang of what the difference was between mid-foot and forefoot. I was starting to understand that I was landing too far forward on the foot and that I needed to land just a bit back from where I was, on the wider and softer part of the pad. I finished my run, very pleased with some new findings, and I was walking back up my driveway when IT happened. I stubbed my toe on the broken up concrete of our driveway. So dumb. I was so alert and aware during the run, but walking back with my dog I was daydreaming a little. It hurt A LOT. But all I could think of was how much more it would have hurt if I had done that while running. A kind warning from the gods of barefoot running to be careful. My husband, as I mentioned above, is pretty sure it's not broken, but it looks all purple and it hurts, but it hurts when I play around with it and not really when I'm walking, so that's a good sign. We'll see how it is in the morning. We need to get this driveway fixed if I'm going to be walking around barefoot on my way home from barefoot runs. So ends the day of my 17th and a half barefoot mile. I hear some of my friends mention that they'd like to give barefoot running a try. I also hear from much more advanced runners that they are thinking of incorporating some barefoot runs in their workout schedule. Sometimes the people that say that to me are intrigued by the fact that I'm doing it, and they think it's cool that I'm excited and enthusiastic about it. This is really great! But I would like to say here that I did not just jump into this on a whim. I have been reading about barefoot running for the past year. I wanted to do it for at least the past six months, but I needed some preparation time. It has been a carefully considered decision. I was aware that there were risks and I finally made the decision to take the risks because I became convinced that I wanted to experience the benefits. You know, it's so natural to go outside barefoot, but because of the things that can happen, shoes were invented. It is also natural to desire to protect our feet from the discomforts. However, there are some risks to wearing shoes too. Different risks. I watch older people try to walk around, however, and I can't help but wonder, as I see some of them struggle and wobble along, if their feet have not remained strong. It seems that the trend for many is for the feet to get weaker and weaker, and for the shoes to get more an more supportive and orthopedic as we get older. It appears to be a slippery slope. And people seem to just accept this as a natural progression of aging and thank heavens modern science and design can provide for this aspect of getting older with all these great shoe products to help. In fact, soon after I had to start buying extra supportive shoes just for walking -- or so I believed, as I wrote about here -- this catalog, Footsmart --which has all these shoes for older people -- started arriving in my mailbox. There are shoes out there that are so motion-controlled that they are like rigid steel. In this catalog are all kinds of products for people having all kinds of issues with their feet, which I'm gradually coming to believe are caused by wearing shoes in general. Or, if not caused by the shoes themselves, these issues are brought on by having forsaken walking barefoot at least part of the time like I had. Maybe it's not so much the shoes themselves as the mentality of abandoning foot fitness. Not wanting to do the foot work ourselves, but have it done for us. I'm not trying to slam these products at all. Maybe they are truly a blessing for people who need them. These are just some of my personal observations and "ponderings." New observations colored by new beliefs about the use and purpose of feet and a new awareness of feet fitness as I feel my feet and ankles strengthening over the weeks. I wonder if there is any way of knowing if older people who walked barefoot all their lives are stronger and walk better? There is probably information out there somewhere about this. Studies. Tribes of people that still live barefoot. Too lazy to hunt for the information right now. Anyway, back to the risks. So, we invented shoes because of some of the problems and "dangers" of going barefoot. But everyone has to choose their risk to benefit level in all the activities they choose to undertake. Some people really love fast food, processed food, and edible other items passed as food created in laboratories. There are risks to eating that food, but people take the risks because they enjoy eating that stuff. There are risks to driving, getting on an airplane, skiing, and horseback riding, and actually risks to partaking of all athletics in general. I have observed young people getting injured in sports activities, but they obviously enjoy the activity so much, that when the injury is healed they usually can't wait to get back to the sport. And let us not, of course, forget that the way we all come into the world -- childbirth -- has risks. But I thank God my mother thought the benefits of having me were worth taking on those risks. But people that I talk to -- some -- seem to really bothered by taking on the risks of running barefoot outside. It seems like such a foreign scary thing to some. There are great objections, and many people act as if you may not have considered the risks. I find it curious that these same people may take other risks that I would not take for their own activities, but they become very concerned about the choice to take the risks of going barefoot, even though our feet were designed for barefoot running, and it is a natural, good activity in general. It just seems to scare some people. What brought this post on today? Well, I read on Jason Robillard's blog (the guy who wrote The Barefoot Running Book: A Practical Guide to the Art and Science of Barefoot and Minimalist Shoe Running ) that there is a danger of barefoot runners breaking a toe. In his post, "Barefoot Running Injuries: Broken Toes" he describes a real-life example of this happening to a runner and he also cautions to be aware of the risks. Well, I am sold -- at this point -- on the benefits I have read about barefoot running and I am undertaking this journey to experience some of these benefits. I have already begun to experience some, one of the main of which is just how darned good it feels. Mr. Robillard claims that there are many more for the beginner barefoot runner to look forward to. I proceed cautiously optimistic. I will take the precautions I need to remain safe while barefoot running. I hope that anyone who wants to try it as a result of reading of my little adventures will also proceed carefully and keep themselves informed all along the way. Two days ago I wrote of working out the logistics of staying in a hotel and going out for a barefoot run. Before coming to this town, I had planned a little running route on mapmyrun.com, and it was across the campus of a prestigious university in this town. What I did not see on mapmyrun was that the first half mile was all downhill. As I set out along on my mapped-out path I was well aware that I was going to have to run uphill on the way home. I decided to go with it. After all, hadn't I recently said that uphill was no big deal to me anymore? I mean, what is uphill really? Just harder work. Just a little more pain. Just breathing a little harder. On that run, on the way back, I discovered a new barefoot concept that I had read about and thought I might be doing, but once I discovered it on this run -- and I'm sure it's only the beginnings of a discovery at that -- I realized that I had not known it. It is this: As I ran uphill, I was struggling a bit, and the main task I gave myself was to try to keep good form. Since I haven't read up much yet on running barefoot uphill, but have only seen a little thing here and there about it, I tried to recall what little concepts I could. One of these was to remember to stand tall. Well, by concentrating on standing tall, I began to feel how running on my mid-foot makes me feel like I'm stretching taller with each step. It was an elastic kind of feeling, like there was a bungee cord from the top of my head in a line to the sole of my foot (the mid-foot/forefoot part of the sole I'm landing on) that kind of stretched out straight and lengthened with each step. That's not the best description of the way it felt, but even as I ran, I knew I was not going to be able to put this into words. It is totally experiential, and has to be "found." But the way to it is to think of that silver cord pulling on the top of your head, the way I've heard it described somewhere. Anyway, run number 2 was this morning. I went the same way. Since I am a baby beginner, and since around a mile is not too far from home, there was not much of an adventure I could have. Nevertheless, it did turn into a little bit of an adventure. I started out the same way I had before, downhill on the university campus, but when I got to the bottom of the hill, pretty scenery and quaint looking trail-like paths beckoned me to turn left. I didn't want to go too much out of the way, because I needed to get back and get ready for my choir festival activities, but I just felt like continuing on. Well, here's where the "adventure" happened. Right when I was about to turn around and head back, to my left was a little flight of leaf-covered stone steps leading to a little trail next to the main road, but through a wooded area alongside the road. I think I mentioned a few posts back that I don't ever intend to run barefoot on a trail. But here it was -- beckoning to me -- my first "trail." Gingerly, I left the smoothness of the paved path, and tip-toed up those steps and on to the "trail." My heart was beating as I weaved in and out between the broken brown pieces of college-student beer-bottle-on-the-trail glass. Even though this was not a real wild trail, it was actually a good starting place for me. It was a trail surface, without being too far out in the wilderness (actually behind the bushes on the left were dormitories and behind the line of trees on the right was a main road). But it felt sufficiently trail-like for me and my feet had new sensations to discover. The unevenness, the sticks, the leaves, the gravelly areas. It all gave me my first taste of what it might be like to run on a trail. After about a quarter mile of this, however, I did want to get back to something hard and paved. Just when I thought my feet were beginning to hurt from the different surface, the trail came into a little clearing where there was a road to turn in on. Oh, how gently and slowly I'm being led along this barefoot journey! About a quarter of a mile after that, I saw lots and lots of girls in uniform walking toward me. It turned out to be the university's lacrosse team. I had to run through them, barefoot, in little clusters. Again, I had to wonder if they noticed I didn't have shoes on? One concern I have is that when I was on the trail, it being uneven revealed some things about my left foot that aren't quite right. I am having some heel pain still on my left foot, and also the fifth metatarsal still feels bruised. I didn't feel it when I was on the smooth path, but it was very apparent as my feet tipped and sank in different directions on the trail path. I had a touch of metatarsalgia on my left foot. It was my one concern about starting to barefoot run. I got the metatarsalgia after stopped running and gained a lot of weight kind of quickly after Thanksgiving last year. I had stopped running in order to take time off to heal plantar fasciitis in my right foot. So, all while I had been training and running prior to when I quit last Thanksgiving, I had been struggling with the plantar fasciitis in my right foot. But my left foot had been so perfect. (This was running in shoes.) I often, while running, would observe my left foot and what it was doing and think, "Why can't I get my right foot to do what my left is doing? Why do I have this plantar fasciitis in only one foot, while the other one is completely pain free?" Well, now -- as they say -- the shoe is on the other foot. (Oops, shouldn't have said it that way, since I'm barefoot). Now my left foot is having issues and my right foot is feeling like it's really getting it. I think what I have been doing to avoid the little pain of the metatarsalgia -- which is smack square in the center of the sole of my foot -- is that I have been sometimes shifting my weight to the outside, causing the fifth metatarsal to feel bruised, and sometimes shifting the weight to my heel, causing my heel to feel sore. So, now what? The metatarsalgia is not worsening since barefoot running, and does not bother me at all on the smoothest surfaces. I think that I can stay on very smooth surfaces for a while and still run. I don't think I have to take off, heal the metatarsalgia, and start building from scratch all over again. I'll try the smooth surfaces, and I hope that the two days off every week, Saturday and Sunday each week, will be enough to promote the metatarsalgia healing all the way. By the way, when I got home and looked up the little detour I had taken on the run, I found out I had gone two barefoot miles today. I hope that wasn't too much. That was this morning, and my feet hurt a little bit around mid-day, when I got up to walk after been sitting in class. But they feel good right now, in the evening. So, maybe it's all good. We'll see. Shhhhh! I have to blog quietly -- in the dark -- and I do not want to wake anyone as I've gotten up early to go out for my barefoot mile while we are away from home. I'm visiting a different city to participate in a choral festival. To maintain my goal of consistency, I'm going to have to get myself out running here, and I'm going to have to do it barefoot, I guess. I set my alarm.for 5:30. Like a "real" runner -- heh heh! Every way I looked at it boiled down to that I was going to have to get up early if I was going to do this. It's been really hot here. And we have rehearsals in the evenings. There are a couple of breaks in the schedule during the day, and I do take the heat well -- especially when I'm only running about a mile -- so I could have tried to do this during one of the breaks. But, well, since I am doing a lot of singing -- we are going to be performing Mozart's Requiem at the end of the week -- I didn't want to chance making myself heat sick or something. I mean, it could happen. Although I am a rather sturdy being, it could happen. It was when I woke up that the little details and logistics of this started to plague me. As I pictured myself taking the elevator downstairs to the lobby of this quaint hotel, I wondered if they would mind me walking in the lobby barefoot. And even if they did not mind, was I brave enough to walk through the lobby barefoot? And my feet will be dirty when I get back -- would it really be polite to walk through the lobby with dirty feet? I could wear my Vibrams through the lobby (ha ha -- to think of my Vibrams as being less embarrassing than bare feet is some kind of new twist in my life). But then I remembered that my Vibrams were in the car. I had almost forgot them and had grabbed them on the way out of the house and just put them on the floor of the car and they did not make it up here to the hotel room. Could I wear my flip flops to the door and leave them there? ("Hi there, front desk, do you mind if I just leave my flip flops here for about a half hour?") Or I could tuck my flip flops in the belt of my waist pack like I do my Vibrams. In the end, I have decided that I will go to my car in my flip flops, put the flip flops in the car and start from there. I can grab my Vibrams and tuck them in my waist belt at the car. Oh ... wait ... I just remembered I don't have to tuck them in my waist belt because I don't have the dog with me! I can carry them in my hands. Okay, so as soon as I finish this coffee -- which I got down in the lobby earlier -- and this apple -- which is the only food I have with me -- I am heading out for my "Out-of_Town" Mile. More advanced runners might laugh at my little plight. All this to go out for a mile. It even seems to defy the idea of the simplicity of barefoot running. Why, in the time I took to fret about this, I could have just scooted through the lobby barefoot, run the mile, and been back by now. Oh, one more thing. Yesterday, when we had to stand up and introduce ourselves at the choral festival, the choir director asked us to tell one "weird" thing about ourselves (or at least something that might make us memorable to the group). So, I told everyone that I had started running barefoot. That's pretty weird. Right? My focus goal this time around as I -- once again -- start out on my quest to become a "real runner" has been a singular one: Consistency. I decided that I wasn't interested in speed or distance or whatever, but that I was interested in developing consistency. First and foremost, consistency in the habit of getting out there. And then after that, consistency in a variety of things, especially the barefoot running form. Well, I went back and found where I had written down all my barefoot runs. 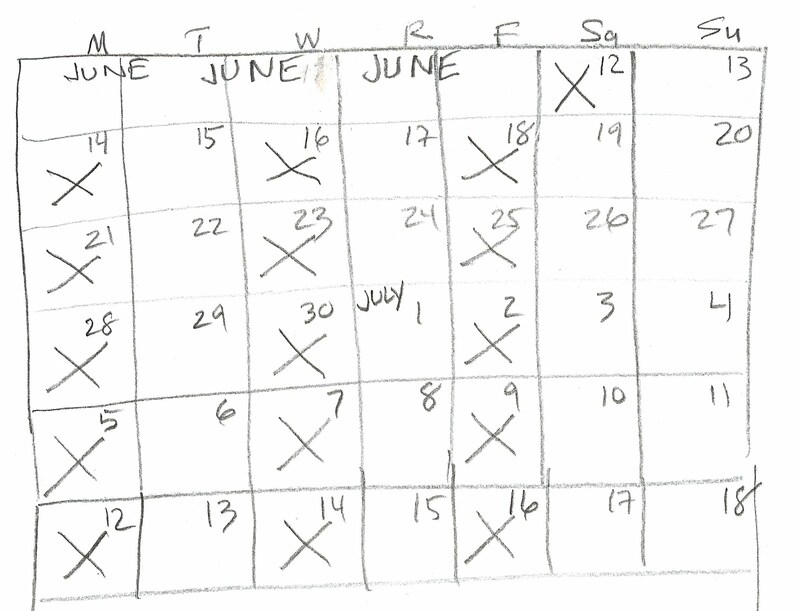 I decided to chart it so I could stand back and have a view of what consistency looked like. It feels really good to have a tangible product of my progress. It feels good to be able to "see" what I've done, what I've been working on. It looks very consistent. There were a couple of weeks of walking in my Vibrams before this chart starts, but I just started from my first barefoot run. I didn't write it in, but on Tuesdays, Thursdays and Saturdays I have been consistently cross-training in Kung Fu. So, although each barefoot mile may not seem all that exciting to read about, something really nice is happening as I plug along trying to achieve consistency. Today I wasn't sure about going out. I had woken up late, it was humid and starting to get hot; I had been on my feet a lot the day before and not rested them enough after my last barefoot run so I wasn't sure if I should go out; I have to do a lot of work today on my feet and won't be able to rest my feet, so I wasn't sure if I should go out. But I remembered my goal of consistency and decided to just get out there and listen to my body. After all, going out there is not set in stone. I can always turn around if my body tells me it's not a good idea. But my body LOVED it and I'm so glad I went out there (although my body did advise me to run in the shade). At one point, I decided to take a slightly different route than I regularly do and made the decision in a split second. Coming toward me a minute later on the sidewalk were two "real" runners. It looked like a father and almos-grown son pair and they were coming fast and hard toward me. We smiled and said hello, and I couldn't help but wonder if they had noticed that I was running barefoot. One last point about the long incline at the end of my run. I used to run from tree to tree to get up that incline. Now, due to my having transformed into a more present-moment state of mind, I don't even notice that I'm on an incline. Because my focus is on the step that I'm taking NOW. It's a great experience. All I notice is the task of the step I have to take now. I may notice that I'm breathing harder, or that it feels a little heavier, but this shift, although it may seem slight, is a total zen difference from the way I used to run on a hill. .... which brings me up to 10 barefoot miles total. This was my first day going out when the ground was wet. It felt fine while running, but afterwards I feel slightly sore and I wonder if wet skin rubbed around a little more? "I just scrubbed my feet very thoroughly, I swear! Would you look at something for me, honey? Please?" Well, he said it was nothing. Today, when I was out there, I tried to be conscious of how this area might have become bruised. Am I rolling my foot a certain way? Am I slamming my foot down? I just re-watched this video. I took it a couple of weeks ago when I was not running on those tiles, but it was part of my walking warm-up pre-running. In the commentary I marvel about how my feet just mold to the crevices, and I mention the sharp edges. Well, I have now been running across this section of tiles and the edge of the tile is where I am pretty sure I made the metatarsal head sore. I have been trying out a slightly different technique while running across these tiles because of the way my foot will tip in the cracks of the tiles. So far, when I am running on the flat pavers, I am landing on my mid-foot, and allowing my heel to gently touch the ground briefly and immediately after the mid-foot lands. But when I get to these tiles, I kind of let my whole foot land simultaneously. It almost feels like I'm running flat-footed. Like I'm trying to skim across water or something. It's hard to explain. Landing with this "flat-footed" feeling makes me feel like I am skimming over the tiles. I run a little slower (is that possible?) and more carefully. Nevertheless, I did feel myself bang my foot bones on the edges of the tiles. Now I am freaking out a little, because when I went to look up what that fifth metatarsal bone was called, I read an article about common injuries to the proximal head of that fifth metatarsal, including fractures. "Avulsion fractures!" "Jones fracture!" "Stress fractures!" "Lions, and tigers, and bears --- oh my!!" You barefoot runners who start reading this blog and have read other barefoot running blogs and have been vicariously enjoying the toughness of those other barefoot runners -- well, now you will behold the wimpiest, most nervous, and most tender-footed of the barefooters -- "Barefoot Fresca." Even though he told me it was nothing -- just a bruise on the bone, I will not rest in peace until my husband gets home later tonight and can reassure me that I don't have one of these fractures..
"Honey .... will you check the proximal head of my fifth metatarsal for me? I just scrubbed my feet thoroughly. Honest!!!" I wrote yesterday about a decision not to run in a 5K I signed up for (Not Ready to Race). Well, it turns out that a friend of mine, ran in that race and posted it in a FB status update. I was so happy and congratulated her and sent her a link to my blog post in case she wanted to hear my "story" about the race. Well, that lead to her telling me about another local 5K coming up at the end of October. I think, based on the way things seem to be going, that ought to be quite do-able. So I have signed up for it. Now, the mystery is -- Will I be running it barefoot? Will they let me run it barefoot? Should I aim to run it barefoot? Should I make it a conscious goal? No! No, I just can't! But ... but .... what will happen? The way this barefoot thing pulls me along, there is no telling what I'll be doing in October. If there is one thing this barefoot quest is teaching me it is that: I do not know. Last year at this time, I ran in a local 5K race. So, I signed up again this year, hoping that I could participate again. But tonight is the night of the race and I'm not prepared to participate. So, I have made the decision not to show up there tonight. I want to blame this whole barefoot thing for my not being ready for the race, because of how gradually I have had to proceed with barefoot running. But of course, that would be shallow. "If I had started up running in shoes I would easily be running 3 miles by now" I'm tempted to say to myself. But that is so not necessarily true and is based on my "old" way of thinking about running. Although at first glance it might seem like I could have been ready for the race by now if I had worn shoes, I have to go back in my mind and remind myself where running in my new running shoes got me. Notice that I've got my foot stretched out way in front of me and I'm coming down on my heel. This picture really upset me when I saw it because I had been trying to practice chi running while training. (In chi running, like in barefoot running, one does not want to reach out in front like that, but keep the feet underneath the body while running). I had been trying to apply chi running technique without having taken any workshop in it, just by studying the book (ChiRunning: A Revolutionary Approach to Effortless, Injury-Free Running ). But why did I not have that form in this picture? Well, when I had gone to buy my new pair of shoes to begin training for the Disney half a few months before, the local running shoe store had convinced me to join a running club. Since the schedule of the running club kind of fit my training plan for the 1/2 marathon, I had joined it. At the finishing stretch of the race, one of the coaches from the running club was standing yelling and whooping and encouraging all of us to "kick it in." Despite the fact that I knew I had a developing case of plantar fasciitis that I was trying to find a way around, and despite the fact that I had made a little race plan for myself, I ignored my intentions and my plan in order to "please" the coach who was cheering me on. It is programmed in me to "obey" and sometimes I just respond automatically. Also, in all the excitement of the moment I got a little revved up and lost my head a bit. It was right after this race that the developing case of plantar fasciitis -- which up until then I had been trying to circumvent through various means -- took a severe turn for the worse. After completing the race, I was very happy that I had not been dead last. I excitedly called my sister (who is a marathoner and was going to run the Disney half with me if I trained and had been receiving regular training updates from me). I reported on my race, and she was appropriately encouraging. Just after that, I decided to celebrate by taking my two kids (my son took the picture) out to eat. But when I got up and started walking with them to the main drag of town, I was immediately very worried. The sharp pain of plantar fasciitis had increased 100-fold. "Uh-oh," I thought nervously to myself. "What did I just do?" But I explained it away, "Oh, it's probably just post-race aggravation and will be better in the morning." I limped over to the running store where we had the running club to pick up my cool running jacket for having completed the running club program, and then limped over to have a nice meal at a local eatery. Looking back, I really feel that the "kicking it in" in this 5K race was a tipping point for the plantar fasciitis. It got significantly worse after that day and in my heart I believe that any chance I had of stemming the tide of the injury was completely undone in that one race. So, even though I have a feeling I could finish that 5K tonight in my Vibrams -- in fact I'm almost sure I'd be able to do it, especially if I included some walking segments -- remembering what happened last year causes me to be prudent. Things are going really really well with my barefoot mile, and I know that after I develop a good base, there will be some fun races and running events to attend in the future. One of the new philosophies I'm learning as I barefoot run is that there is a great beauty in the virtue of patience. I wrote about this race last year on my Avocational Singer blog here: Being True To One's Self. Oddly enough, I wrote about how I did, for the most part, stick to my plan for the race. It is interesting that I left out that part at the end when I didn't stick to my plan and responded to the coach urging me to "kick it in." I guess I figured at the time that since I had stuck to about 95% of the plan I had done pretty well. I don't see a contradiction. I was telling a part of the story and that part was true. It's just that there was another part too, and I didn't realize the significance of the other part until much later. I am striving for consistency right now, so maybe this blog will be a little boring as I go from barefoot-mile-run to barefoot-mile-run. But it is never the same mile, even when I take the same route. Today I saw open safety pins on the sidewalk, but did not step on them. Yay! Today a woman runner passed me and called out "Get some Vibram Fivefingers" and I called back "I already have some." I hoped I didn't sound smug. I take my humble place at the bottom rung very happily. But I guess I was a little quick on the uptake to let her know I knew about Vibrams and that I was choosing barefoot intelligently. Sheesh! Who cares! Well, that may just be part of the zen of barefoot too. Not feeling any need whatsoever to explain anything to anyone at all, and just being neutral about what they say and what you think they think. In fact, getting to the state where you don't even think they think anything would be really fine! Everything feels good. Soles, Feet, Ankles, Calves, Knees, Hips, Lower Back, Lungs and Breathing. Even doggie is getting used to my pace and regulating herself so that the leash is loose and my leash arm can be more relaxed. Everything feels pretty good. Today was a new barefoot mile. I feel very fortunate to have those red pavers on the boulevard to run on. They are not hot at all, even in this heat wave we are having. I take the heat really well. I actually enjoy running in the heat. Of course, I am only running a mile, but I remember the feeling from years ago. I bet I wouldn't like to run six miles in this heat though. My feet felt a little confident today. They just wanted to run. Maybe my new form is beginning to habituate. I've been so focused on my stride that I haven't been noticing what my breathing was doing that much. But today, since my feet were willing to just do their job with a little less mindful watching, I was able to turn my attention to my breathing a little. When I am in better condition aerobically, my breathing gets very internal. It seems that my diaphragm takes on a kind of rhythm and just intakes the breath quietly in this little internal place. But I am not there yet, so I have to "train" the breathing a little bit while I'm still not in the best condition. Many years ago, my cross country coach had advised me to breath in with two steps, then breath out with two steps. I had used this "method" for many years. He gave me that because I had been a hysterical gasping breather. Over the years, this little rhythmic tool -- in two -- out two -- has been a great way for me to develop my breathing. Over the years it has refined and become less jerky, and the last time I was running, I found that little internal "takeover" thing that happened with the breathing. But a couple of years ago, I read some article about how the -- in two -- out two -- method was not recommended anymore because of the fact that the runner always breathed in on the same step and it created some kind of running imbalance. Well, that's just the kind of thing that will drive a technical kind of person like myself nuts. So, what do I do now? I tried -- in three -- out three -- but discovered that I still took the breath on the same foot, because it all came out on an even number. So then I tried -- in two -- out three -- an odd number so my foot would be different. I tried thinking of a word that had five syllables and then using that word for the breathing. I came up with "Serendipity." Breathe in on Ser -- en, and then breathe out on di -- pi -- ty. It's amazing that you can actually "tell" your breath how you want it to act and it will conform if you practice enough. Now that I am learning how to listen to my body, and am discovering what my bare feet tell me about running form, I've had the thought that perhaps I was imposing on and controlling too much the breath before. As I've been working on just running safely with bare feet and getting the soft light step down, I have been letting my breath just kind of find it's way. I don't gasp -- like I did as a beginner runner many years ago, but I automatically default to the in-two, out-two rhythm. So today, I just brought my attention a little to the breath and was kind of wondering what to do there. Sometimes what the body wants to do is NOT that efficient. Sometimes the body is lazy. So, there seems to be a balance between finding what the body prefers, what is natural in the running form, but guarding against bad habits that come from "short cuts" or "lazy paths" that the body tries to take to get out of working harder. That reminds me. I had some breath development -- finally -- last night at Kung Fu while doing crunches. I had just read somewhere that the timing of breathing was important to a certain discipline -- oh where did I just read that -- oh, yes, it was for the sport of archery. The breathing had to be synchronized with the drawing and releasing of the bow in a certain way. And I just read it in that book I've mentioned here that I'm reading The Practicing Mind: Bringing Discipline and Focus Into Your Life . Well, after having pretty much just read that concept, I was doing crunches last night at Kung Fu, and blowing out on each crunch -- like I had been told to -- and I began to think of how natural it would be to not draw in air between each crunch, but to just let the air come in on its own before the next contraction. And then -- woo wee! -- I got it! The manipulated crunch breathing that I'd been doing for 3 years finally ceased and a more natural and unified breathing took over. I didn't have to think about it, it finally wed itself to the movement of the crunches. Well, I am hoping that I will be able to find a better more integrated breathing action to my barefoot running. Anybody out there know anything about it? I have written in this little blog about how I discovered running when I was a teenager and developed it a little into my mid 20s, but then stopped for many years, but always wanted to return to it. I have been trying to become a runner again for at least the past 6 years, and each of several attempts has somehow been waylaid. And my latest attempt to begin again has been only recently, and after a 6 month layoff to heal a bad case of plantar fasciitis. Now that I've recapped that information, I would like to mention a that significant factor that has been adding complications has been that I'm overweight. 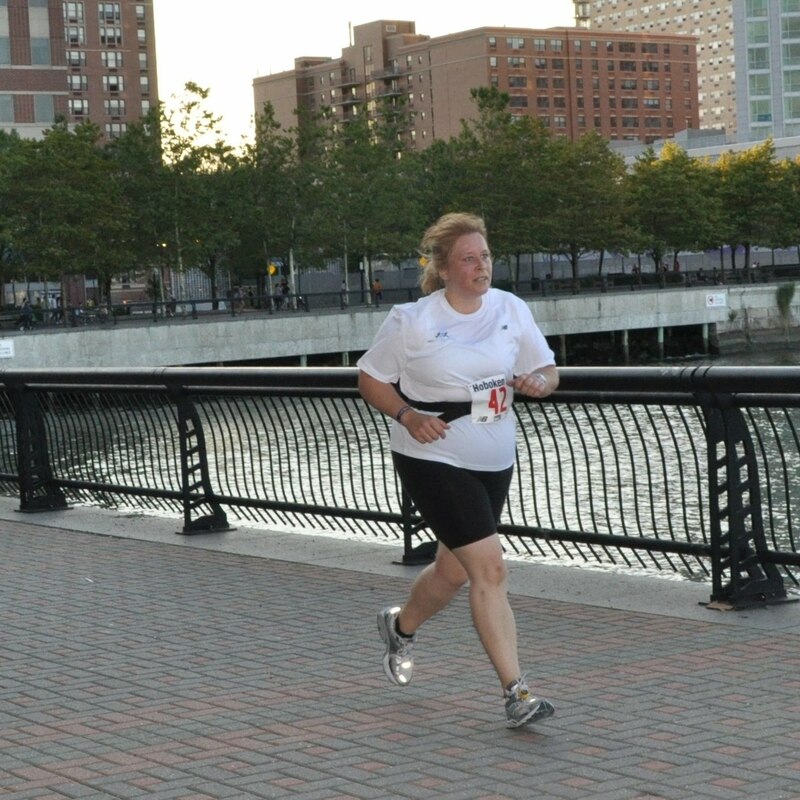 In fact, one of the factors that kept me from returning to running for many years was that I became very very overweight. I just read a blog that gives advice for people who want to start running while they are overweight: Training: Overweight and Starting a Running Program at Running-Advice.com This made me want to write about this aspect of my running. "It is important for all runners to be in high quality running shoes, but this is even more important for overweight runners. Running shoes are designs to absorb the impact of your body weight. Heavier runners need to make sure that they have shoes designed to support their weight and they will need to replace their shoes more often than most. Most running shoe brands have a model of shoe that is designed to support women over 140 pounds (mean over 165 pounds) to help in protecting your joints and lower-legs. Go to a running store and have yourself fitted for shoes and plan to replace your shoes every 3-4 months. [all emphasis mine]"
At first glance, this advice seems logical and sensible, just as the advice to get a good pair of running shoes for any runner seems sensible. In fact, this is exactly what I thought, and I was a good girl and made sure I got a really supportive pair of shoes so that all my weight would not hurt my joints. But some of the experiences I have been having now, with barefoot running has changed the way I view this advice, and I would like to explain why I now object to this advice. I object cautiously, because am a baby new barefoot runner and I don't want to be "cocky" about it in any way. I humbly and carefully object based on the experience I am having at present as an overweight runner wearing minimalist shoes and also running barefoot. In order to explain, I want to backtrack a little and tell a bit of my running and overweight story. I first started gaining a significant amount of weight after I got married. In fact, within a couple of years I had gained well over 100 pounds, and was to put on even more than that while pregnant. So, I had this big obstacle in my mind that I needed to lose weight first before I could ever run again. The experience of being that heavy was so traumatic, after having been a relatively normal weight growing up, that I couldn't imagine myself running. All I could picture was that my whole body would become injured under the strain of all that weight: my knees, my feet, my hips, etc.... In fact the thought of the way everything would shake and move around horrified me and seemed downright dangerous. Because I gained all this weight so rapidly I started having problems with my feet. I now -- many years later and looking back -- realize that the foot problems were not, as I thought then, merely because of how heavy I was -- although that was part of it -- but it was more so because of how rapidly I had gained the weight, and how my foot strength was not able to increase fast enough to accommodate it. I'm not sure how much extra weight the feet can condition to carry. There may be some top limit on it. But I thought the weight itself was over the limit and my feet were in such pain, that in the middle of the night if I woke up to go to the bathroom, I had to hobble like a crippled person. Now, I had always gone barefoot or in my socks in the house. This was my habit for years and years. But when this foot trouble developed, I decided that it was because I was standing with all that weight on a tile floor washing dishes without shoes on. So, I bought a very supportive pair of shoes and began to wear them all the time. White New Balance Walking Shoes. This is a complicated situation, because I believe starting to wear supportive shoes further weakened my feet. Although the weight was a factor, it was more that the weight was gained so rapidly, leaving the foot strength behind. Now, by wearing supportive shoes, I had started down a slippery slope to weaker feet, when what I really needed was stronger feet, to accommodate the extra poundage. Not stronger shoes. Stronger feet. Okay, got a little sidetracked there, but I don't think the details about the feet are irrelevant to the story. Essentially, this new condition of being morbidly obese prevented me from even thinking I could go out running. I would drive in the streets every morning and see the runners out there and stare longingly. But the dream of being out there with them seemed so so far away. Too impossible. I was in a kind of despair about it for along time. I felt I was trapped. I want to start running. I can't start running until I lose weight. I can't lose weight. So I can't run. Finally, about six years ago, I became very determined to correct my food imbalances. I joined Weight Watchers Online (I was already a lifetime member for many years) and seriously tackled the weight. I lost 70 lbs. 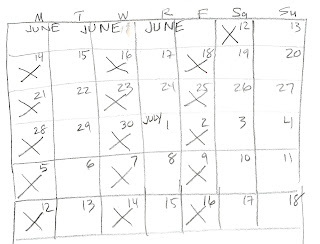 For the first 8 months of this serious attempt at improving my nutrition management, I deliberately did not exercise. I did not want to use exercise as an excuse to eat more. I wanted to learn how to manage food based on my nutritional and caloric needs in feast or famine. I didn't want to have to depend on exercise, but I wanted to be able to adjust my food intake based on activity, and be happy with the lesser amount of food required when one was less active. After the 8 months passed, however, and I had lost about 50 pounds without exercise, I decided it was time to begin a walking program. And it was after losing 20 more pounds while walking regularly -- for a total of 70 pounds lost altogether -- that I decided I could finally run. I was very very excited about this. Well, I could tell the whole story about that first time running after all those years, but I will skip over it. I was gradually adding stretches of running to my walk and feeling really great about it, but then something happened that threw me for a loop and completely derailed me from this attempt. I became very discouraged and halted all my work. I ended up stopping my newly found return to running, and I ended up gaining more than half that weight back. So, now let us fast-forward to last year, and a new attempt to run again. I had been losing weight again, and was now down to -50 from my original weight. This was 20 pounds heavier than when I had begun to run again the last time. I didn't want to wait to lose that 20 pounds to begin running again, because I had decided to use a training program for an "absolute beginner" to do the Disney half marathon, and I needed to start on a certain date and it was time to start, according to the plan. So, I began while I weighed 220 pounds. I was a little worried about this, but I had built an 8 week walking base using Chi Walking, and had completed a 5K in 48 minutes walking ( a good walking clip) and was feeling pretty good. Besides that, I was planning to use the run/walk method, which seemed conservative and realistic, and I was going to be building very very gradually. And besides that I had bought myself a fantastic new pair of really supportive running shoes to start my training. However, things did not go well, and by the time I had got up to 6.5 miles, I had to step things back because of a bad case of plantar fasciitis. I went down to the Disney marathon and could not run in the 1/2 that I had signed up for. My family was there and I am the only one in the family who has not run the Disney 1/2 or the marathon. They've all done it. But I did think it was very interesting, as I watched the marathon, that there were a LOT of overweight runners running in the marathon. Really? I marveled. There are overweight marathoners!! Boy, they must eat a lot. But, despite the pounds, I did not want to wait this time to get down to a better starting weight for running. Despite the plantar fasciitis last year, and the fear of reactivating it or re-injuring my foot, I have begun again. AND I have begun in minimalist shoes AND now I am running barefoot. And the miraculous thing is that my feet, knees, hip joints, etc ... feel fantastic!! I was really worried about attempting barefoot running while overweight, but it seems to be going very well. In fact, I am not even having to use the run/walk method at all. I am running at a very slow pace, probably over 12 min/mile, but, nevertheless, things are going well. I'm feeling very good, with no joint pains anywhere. I now believe that, just like any runner, good form and proper alignment, which can be learned through barefoot running, can aid the overweight runner and prevent injuries and undue stress, just like it can for any more standard weight runner. The only difference is that the foot strength needs to be developed to a greater degree and, actually, all the muscles need to be stronger, and just as the process of developing muscles is a slow one that must be taken in stages, the key to overweight running is to build that strength even more gradually than the lighter runner. An overweight person can become fit enough to manage and slug his weight around. He or she has to take the weight into account as a factor, but I think that using supportive shoes could actually even harm the overweight runner more because I think our feet become very weak in those shoes, and, if anything, an overweight runner needs stronger feet than others, not weaker ones. Having said all that, who am I? Am I anybody who knows anything? No! I give some opinions based on a little bit of head knowledge from reading, and a very little bit of experiential knowledge. It is my opinion only and should not be acted on. Just thought about a little bit. In the meantime, I know the difference between running when I am a more standard weight and running when I am this heavy, and it is a much more wonderful experience running lighter. So, I do plan to adjust my nutritional approach again and start taking care of myself and not eating more than I need. But I just wanted to say that just because I don't have a handle on all that just yet does not mean that I can't run AND that I can't run barefoot. I had written the other day that I might use Wednesdays as a Vibrams day to lay the groundwork for Wednesdays becoming the eventual "long run" day. But when I looked outside today, I just couldn't bring myself to put them on. I didn't shudder at the prospect of a barefoot run -- as I wrote happened for the first few times out -- but looked eagerly forward to it. What is happening? Lots of little observations about today so I will break them down into separate components instead of trying to unify this piece of blog today. I am more and more reluctant to wear my running shoes anywhere. I feel that bump in the arch support and it really bothers me now, and after walking at length in them I feel very uncomfortable. Something else is happening too. When I see a shod runner, their shoes look really heavy, cloddy, and cumbersome to me. It's not like I'm making a judgement or anything. It's just that my body responds kinesthetically to the sight of the shoes. It knows what they feel like and it knows the way it wants to feel now -- light and free. One of the most pleasant things about barefoot running is how wonderfully cool it keeps my feet. I can feel a breeze on a really hot day. I never would have realized how hot it was to have my feet in socks and running shoes if I had not tried it this way. I am more and more inclined to stay with the present moment and just run this simple barefoot mile over and over again as I work to "perfect" it. I put "perfect" in quotation marks because there is not really a moment when I would consider it perfect, but just that there is no need to rush ahead because there is PLENTY in a barefoot mile to work on. Enough to keep me busy for a long long time. So why rush ahead? This is the first time in my life that I've actually really begun to understand this idea that there is no need to rush ahead. Because there is so much to do within that mile each time. And there is something about the consistency of it, and observing it get better and better -- just growing on its own -- that is really satisfying. I decided to pick a new route this morning. The route I've been taking has started out on a boulevard that has a beautiful view, but then turns and travels along neighborhood blocks and sidewalks. But I wanted to stay all on the Boulevard with the view the whole way today -- even though I am not looking at the view because I am busy watching the ground but do "feel" the view there -- so I planned a walk out to a starting place and run the mile-with-the-view from there. The Boulevard has terra-cotta colored pavers, and they are usually smooth and cool, even in the sun. My entire route today was mostly on these pavers and -- to my surprise -- I found that I missed the varying surfaces I had on the sidewalk run. 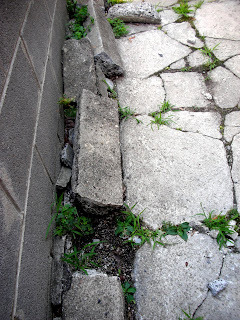 Some of the sidewalks on my other route were the kind of concrete with lumpy stones set in, and on those sidewalks, although they were rougher, I felt a pleasing massage. I also missed today the unevenness of the sidewalks where some have shifted and tilted over the years. When I run on the uneven surfaces, my feet navigate every step, sometimes tilting this way and sometimes tilting that way, and sometimes bearing the weight differently as they shift to find the right footing for each moment. I am wondering if that is part of the value of barefoot eventually? I have been taught in the past to try to maintain a consistent stride. I always strove to have my form regular, even and repetitive. But I'm wondering if this previously-held idea of form has been a condition for repetitive stress injuries, and if the flexibility and changing positions of the bare foot is healthier for a runner? One of the reasons I hesitated in beginning to run barefoot was that, while I had heard that barefoot could be remedial for plantar fasciitis, I was not sure it would be good for metatarsalgia. I tried to do some research about it, mostly coming up with anecdotal information. I read that running barefoot could actually cause a case of metatarsalgia if the form used was poor -- especially if the person was slapping their feet on the pavement. When I read about that, I thought, "well, maybe if I'm really careful about form I can try it." In the beginning, I did feel pain in the metatarsal area in the Vibrams. I don't know why I persisted, but I just believed that the running in the minimalist shoes was not going to make the problem worse -- and it didn't. When I started to run barefoot, I could definitely feel that metatarsal spot burning a little, but I monitored it. 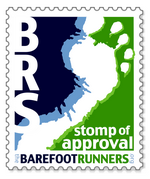 With each barefoot run it has been getting better and better. But I have been wondering if the natural tendency to avoid the soreness of that spot might be causing me to shift my weight unfavorably to another part of the foot. In fact, I had wondered if the scrapes I had on my foot were because I was doing something like that. So, when I had the bruised spot on the heel after Monday's run, I wondered the same thing. Even though the sore metatarsal spot is getting smaller and smaller and more and more minor, I wondered if I was unconsciously avoiding that spot and putting more pressure on my heel. Well, when I was out running today, I focused more than ever on my left foot form to learn if I was doing something there. Then it happened. I felt one of those little pebbles under my left heel. One of those little ones you step on so suddenly and kind of back off immediately. The pebble touched the sore spot in the heel and I knew in a minute that this is what had caused the bruise and not my form. It's always good to realize the cause of something. Once again, my feet taught me the answer. I also was writing about how I wondered if this process might become automatic at some point and become less present, and go on automatic pilot like some of my running in the past -- in shoes -- has been. Well, lo and behold, a book I'm reading addresses this concept. In the book The Practicing Mind: Bringing Discipline and Focus Into Your Life by Thomas W. Sterner, he talks about a state called "present-minded awareness" that comes about when someone is really focused on the process of what they are trying to accomplish. ",,, when you are a beginner at whatever activity you are attempting to learn, it takes all your concentration to accomplish the activity and your mind is empty of chatter. As you become more adept at the activity, it actually becomes harder to concentrate solely on performing it." I have been finding, as I explained in the post before, that barefoot running is requiring me to be in a process-oriented, present-minded state. I need to apply this state of mind to my singing (and I originally picked up the book, The Practicing Mind , thinking of my main discipline of practicing singing), but in order to discover it, it seems that I had to cross over into barefoot running to find it. The things I"m learning, once having been kind of "forced" into that state, can be applied to other activities. Just a few times barefoot running, and running seems like a completely different activity to me. It is teaching me. Well, after accomplishing another barefoot mile today, I think I am beginning to see the way this is going to go. It's not going to be about goals or what the next advancement is going to be. It's going to go slow. Barefoot running is managing to teach me a completely different way of being. I notice that when I am barefoot, my alertness level raises pretty high because I am being so careful to avoid harmful objects and to step well. When I had put the Vibrams on last Wednesday, I had felt a sense of relief from that heightened sense of care. Almost a feeling of relaxation. Another time I have the level of alertness that I have while I'm barefoot running is when I'm driving a car. There is a sense of responsibility, and an awareness of a very present and conscious state of being. I really can understand how, after 6 - 7 barefoot miles, I might be tempted to think - "okay, I've got this down. I can start increasing distance (or frequency)." But today I learned that I have not exhausted the possibility of this mile yet. I may think I understand or "get" the barefoot running form quite a bit, but I really have not even yet begun to understand it. For one thing, as I was running along today, I noticed a kind of "scuffed" feeling at the front of one of the toes on my left foot. I didn't feel myself scrape or drag that toe, but became aware of it in a way that told me I wanted to take care not to do that. I began to ever so slightly raise my toes, and kind of set them down again with each footstep. However, as I did this, I then began to start "grabbing" the ground with the toes, and I recalled the exercise I had done in the park in the barefoot running clinic a few weeks ago. Michael Sandler (author of Barefoot Running: How to Run Light and Free by Getting in Touch with the Earth ) had us walk across the grass grabbing the ground with our toes like a cheetah spreading her paws and grabbing the ground. The feeling I had of using my toes this way came into play today while running along, all because of that moment of awareness of the scuffed feeling on my toe. "Wow," I thought, "it really is true that my feet are teaching me the form." I realized that this was going to take time. I had to throw away all ideas of how I would progress, and just stick with this simple barefoot mile. In fact, I probably jumped to the mile too soon, but, well, since I'm here, I'm going to stick with the mile and not go back to a half mile. I don't get tired at the end of the mile, and the form does not begin to disintegrate, so I think I'm okay. Besides that, it just feels like there's plenty of time in a mile to figure out what's happening, correct or add something, and practice the new addition. It seems just right. I think that I will just know when it's time to go further. I have been toying with the idea of using Wednesday as the "long run day." But a "long run day" in seed form. One that will evolve into the long run day eventually. I was thinking of having Wednesdays be minimal shoe day - Vibrams. There's only one thing that bothers me about it. Barefoot is a lot of focus and concentration. What I sometimes loved about running in the past is that I would kind of get on an automatic pilot and just start thinking about so many things. It seems like barefoot, at least in these beginning stages, takes away that daydreaming quality while running. Is that what a running shoe does? Like putting the car on cruise control on the highway? The shoe does the work? When I'm running barefoot, I feel like I'm doing a lot more mental work, and it does feel hard. I wonder if, once my feet are more conditioned and I become more advanced in barefoot running, if I'll have to pay as careful attention or if I will be able to go a little more on automatic pilot at times. I ran yesterday and my feet did not get the "sunburnt" feeling of slight soreness that came afterward during the first few barefoot miles. Does that mean I can go out again today? So far I'm only going out 3 times a week for one barefoot mile. But someday I would like to have a daily running habit. When is it right to do more? I have planned to listen to my body. One thing that I've noticed about this barefoot running is that I recover much more quickly from a run than I had in the past when running in shoes. Now, there might be some advanced runners out there who might think it was funny to talk of "recovering" from a mile run, but, since I am at the bottom rung of conditioning, I have needed recovery time. Recovery from a mile run when you are trying out barefoot running is not so laughable because there are skin issues. However, when I was run/walking last year and trying to build gradually so I could try the Disney half marathon, I had a lot of stiffness after my runs and it would take a full day to recover, especially after the long run/walk day. But I am just so amazed at how great I feel after running barefoot. There are so many choices facing a person who is trying to build a foundation to be a runner. My first choice was to build consistency. I chose 3x a week because I also cross train with Kung Fu. I didn't want to run on Kung Fu days yet. Eventually, I would like to run 5 - 6 days a week. I would like to be able to run a small amount on Kung Fu days. I have no idea if that is going to be a good idea or not. Will I never want to run at all on the same day as I work out with Kung Fu? Or will a small amount of running on those days be okay in the future? I see all these young people at Kung Fu who take many classes in a row. "I've been here all day!" they'll announce proudly as they come into the dressing room to get a drink. "I took the basic class, then Tai Chi, then the advanced class, and now I'm going to do Chinese Kick Boxing." I think of myself being so-o-o-o careful. Too careful, even. When I'm finished with an intense Kung Fu workout, I see the kickboxing people come in. Some of the people from my class continue on to the kick boxing class and as I'm leaving the school I can't even imagine working out again after the intense hour I just spent. As I'm walking out the door, one of the instructors might say, "Going to join us for kickboxing?" And I'll smile and say, "Maybe some day I'll be fit enough for that." But I wonder if doing so much is good? Is that what I'd like to build to? Just being able to do intense workouts all day long? My own impression is that "less" truly is "more." I have this kind of "slow and steady wins the race" philosophy, and this belief that recovery time is valuable and that good stuff is happening, and that things should be paced and spaced out. Am I just kidding myself with these beliefs in this slow way of proceeding? I am so afraid of injury, but my slow careful run/walk approach to getting back into running resulted in an injury last year. I just really deeply believe that going slowly, taking my time, working on form, building bit by bit and in a smart way will result in something better in the long run. The danger is that one can go too slow and not progress. But progress to what? And what for? How Long Will I Be a Beginner? I ran another barefoot mile today. On the way out to the main drag, while walking in my bare feet with my little dog, I was saying to myself, "I'm definitely going to be a minimal footwear runner. I can't keep doing this." I had a little more fear and worry today. The other days, as soon as my feet hit the pavement, it was sheer childhood joy. I think it was the little scrapes that I wrote about the other day. They were such teeny tiny minor scrapes, but the fact that I had not felt them happen, and that they weren't apparent when I first came back kind of freaked me out a little bit. I'm the type of person who does not like skin to be punctured or torn or worn away in any way. It gives me the skeeves. I often think of how I don't think I ever could have been an R.N. It really icks me out to watch thosel shows where you can see them performing surgery. So, I am prissy and do not like to get little cuts and bumps. There are really tough people I know who get knocked around and have all kinds of scars and don't blink an eye about it. It's something that's part of life for them. People who work with their hands, or outdoor sports people -- or even the other tougher fighters in my Kung Fu classes -- all seem to sport their little bruises, bumps, cuts and wounds as if they were some kind of merit badges or something. But me, I'm nervous and timid about stuff like that. I will probably develop really great self defense skills because my motivation to not get a black-and-blue mark will be extremely high. Anyway, so today, spoiling the joy a little bit was a tinge of worry. I was worried I was going to scuff my feet and scrape them. This bit of worry was causing some tension. Yet an important part of barefoot running form is to stay very relaxed. I spent the run with a task, therefore. The task was to stay relaxed and mentally calm about my worries. "If you're so tired that you can't keep proper form up enough not to scuff your feet, then you should stop and walk," I said to myself. In fact, scuffing my feet can be a sign that I'm losing concentration and/or going beyond what I should be at this point. "Wow, it really is true what they say -- that your feet can tell you how to train." The mile was over way too quickly. For my Wednesday run, the one where I had first noticed the cuts, I had decided to go out in the Vibrams just to be safe. Since I was in the Vibrams, I decided to run farther than a mile and went a mile and a half instead. I've got two things being conditioned here -- my foot strength, and the skin strength. The foot strength got a head start because I started running in the Vibrams for a while before I tried the barefoot running. But now that I've started bare foot, I have to proceed very gradually because of the skin. So, today when that mile seemed to fly by so so quickly, and remembering how good the 1.5 miles had felt Wednesday, I wondered if I should do a mile and a half barefoot? Those little scrapes had healed up pretty well, and just like" ac" -- the commenter on the blog that day -- had said, the skin grows back strong. So, maybe my feet could do it? But I decided to stick with the mile. I feel like I'm going to be doing this barefoot mile for a long time to lay a really good base. Even though I am new to this barefoot running, it is having many life-changing effects on me. One thing it is driving home is that lesson that I always want to jump ahead and do more. Go faster and farther. Barefoot running is making me understand in a new way how to be happy with where I am at. As I ponder and ponder over why I got the case of plantar fasciitis last year, one factor looms the largest of all. It is that I had signed up to do the Disney half marathon. Even though I gave myself ample time for a relative beginner to get there, and on paper my plan looked good, I believe that having this deadline pressured me in subtle ways. I couldn't just stick with the moment and how it made me happy and how it felt good. I had to build by a certain time. So, now I would just like to sit with what I am doing now. I had signed up to run in a 5K on July 13. I ran in this 5K last year and I think I put my plantar fasciitis over the top with that race. So, this year, I can see that I have been running my modest barefoot mile 3X a week, and just this week I ran 1.5 miles in my Vibrams fairly easily. But I am not going to be able to run a 5K by July 13. So, I will not allow that deadline to pressure me. I simply will not run it.